On this site you will find much information on the bugle call Taps, the history of bugles, and the role of bugles and buglers throughout American history. There is a section on Taps Performance Guidelines for those who are interested in sounding Taps for funerals and ceremonies, and a section on Getting Started on the Bugle, for those who are new to this subject and looking for resources. You will also find personal stories of buglers and links to other Taps and bugle-related sites on the Internet. Click on the Index tab above and you’ll get a listing of all the posts on Tapsbugler. New information and photos will be posted from time to time, so I encourage you to bookmark this site and return periodically to check out any new material. And if you have bugle stories or photos you wish to share, please contact me at Jari Villanueva I have tried to correctly attribute information and cite the sources of the material posted here. If you believe there is any problem with the accuracy of the information on this site, please let me know and I will correct it as soon as possible. An excellent bibliography for my Taps research can be found at the end of my booklet, Twenty Four Notes That Tap Deep Emotions: The story of America’s most famous bugle call. You can read an excerpt of Twenty Four Notes here. All the information on this site is copyrighted, all rights reserved. If you wish to use any of it, please contact me Jari Villanueva for permission, which I will usually grant. The bottom line is that it is important to me to get the correct information out about Taps and help enlighten people about the history of bugles in the United States. To this end I am willing to make this material available on the Internet. Two, you could engage me to speak at your local Civil War Roundtable, library or community center. This is something I’ve done many times, visiting as far north as West Point, NY and as far west as Erie, PA.
Three, if you are interested in even more information than you will find here, please visit my sister website JV MUSIC, where you may purchase my booklet Twenty Four Notes That Tap Deep Emotions, along with CDs of Civil War music performed by The Federal City Brass Band and Helen Beedle; A Pictorial History of Civil War Era Musical Instruments & Military Bands, Mark Elrod’s fantastic book on Civil War brass instruments; 20 Bugle Calls of the US Armed Forces, a collection of the most commonly used modern bugle calls; and music I have arranged for brass ensemble, including many pieces from the Civil War era. When I first developed an interest in the bugle and began my research I found that the manuals, books, and other published information on the subject were soon exhausted. Outside of encyclopedias and music dictionaries, there was not much written on the history or use of the bugle in the United States military. Oh sure, there were articles written on the subject (most dealing with the origin of Taps) but there was no one authority on the bugle. I have spent the past twenty years doing research and developing the material that is posted on this site and published in my booklet. My information on Taps has appeared in many newspapers across the country and on many websites. I have appeared in a History Channel segment about the origins of Taps and in many TV stories that pop up around Memorial Day and Veterans Day. Now you need only to do a Google.com search with the words “Taps,” and “Jari,” and you get many hits that will lead to me. Many historians have guided me along in my quest to uncover information on bugles. Three who come to mind, and to whom I owe a huge debt, are Jack Carter, Mark Elrod, and Randy Rach. There are many other collectors and historians to whom I have been much indebted for their expertise and advice. I have also gained much information from the many re-enactors who portray Civil War field musicians. It is through these living historians’ eyes that I’ve been able to understand how the bugle was used in battle, camp life, and ceremony during the Civil War. Thanks are in order to all the many buglers, both military and civilian, that have helped me with this and of course to the many historians with whom I have had the pleasure to work. I also want to thank my lovely wife and webmaster Heather Faust for all of her hard work, without which none of this could be possible. I hope you enjoy this site and will come back and visit us again. Please contact me with your feedback and comments via email. From 2008-2017 Villanueva worked for the Maryland Military Department, serving as the Director of Veterans Affairs, Maryland National Guard Honor Guard (MDNGHG). The mission of the MDNGHG is to provide Military Funeral Honors to Armed Forces Veterans in Maryland and performs over 3,500 ceremonies each year. He is also retired as a conductor/commander of the Maryland Defense Force Band and retired at the rank of Lt Colonel (MDDF) in the Maryland Military Department. Villanueva’s military awards and decorations include the Meritorious Service Medal with one oak leaf cluster, Air Force Commendation Medal, Air Force Achievement Medal with three oak leaf clusters, Air Force Good Conduct Medal with six oak leaf clusters, National Defense Service Medal with one service star, Global War on Terrorism Service Medal, the Maryland Distinguished Service Cross, the State of Maryland Meritorious Service Medal and the State of Maryland Commendation Medal with one oak leaf cluster. Villanueva is a graduate of the Baltimore Public School system and earned a Bachelor of Music Education degree in 1978 from the Peabody Conservatory of the Johns Hopkins University. In 1984 he received a Master of Music degree from Kent State University, Ohio. He is also a 2006 graduate of the Air Force Senior Non-Commissioned Officer Academy. From 1998 to 2010, Villanueva was an adjunct professor in the Music Department at the University of Maryland, Baltimore County, where he served as Director of Bands. 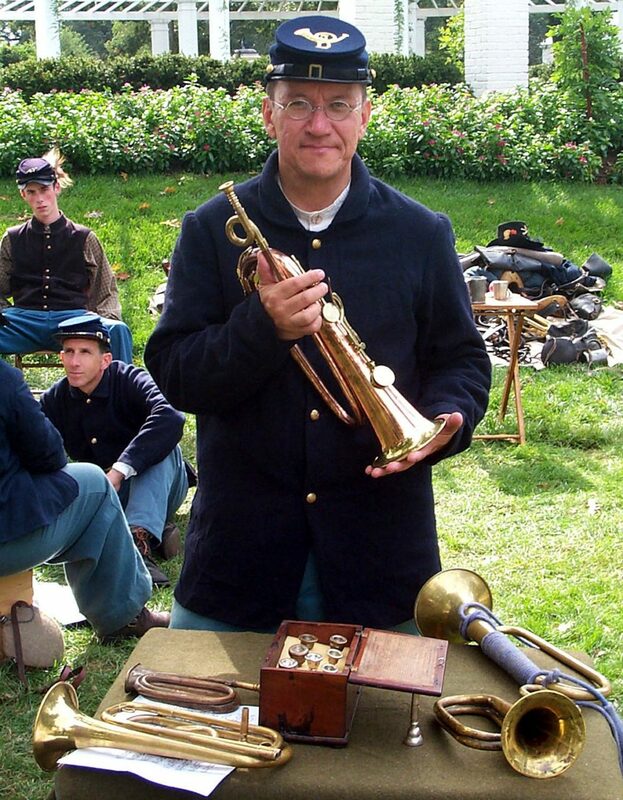 A Civil War historian and re-enactor, Villanueva is Artistic Director of the National Association for Civil War Brass Music, Inc., where he directs and leads The Federal City Brass Band and the 26th North Carolina Regimental Band, recreated regimental bands of the Civil War era. He also sounds bugle calls at many re-enactments. In addition, he is music director for the National Civil War Field Music School where students learn to play fife, drum and bugle. He is a member of the American Legion Post 109 in Arbutus, Maryland, the Air Force Musicians Association, the Maryland Historical Society, the Maryland Military Historical Society, Phi Mu Alpha Sinfonia, and an associate member of the Society of the Honor Guard Tomb of the Unknown Soldier. He is married to Heather Faust and resides in Catonsville, Maryland. Your website hits the patriotic note spot on. From years ago I recall bugler music that I know as “Kansas”. Do you have any info on such a tune or know who might have? I have been following this. I can’t speak as to an official military opinion but I do have my own TapsBugler thoughts about this. Bottom line is that if someone really wants to honor those in the military, learn to play the bugle and walk outside every evening at 7 or 8 and play Taps. It would be more meaningful and would probably have not caused as much angst in his community. To play it on a loudspeaker seems only to annoy. is it appropriate for taps to be played by an ex-military member over a loudspeaker daily at 8pm to a town? or is the song just for certain occassions and by active military? wondering due to a controversy in glen rock PA, would love to hear what the official military opinion of this would be. Randy, Great article THAKS. Taps is such an emtional piece ! I have a question.I own a WW1 Bugle which was owned my my Father’s father. It is a Z Ephir made by Nil melior made in NY city. Patent Number not noted. What is the value of this instrument. It is in OK shape. Thanks for your anticipated response.